So he once wrote on the internet. Funny: Dr. Waitkus, the Egyptologist translating the texts and opposing their electro-thesis, is not only an Egyptologist but also a diplomaed physicist – and even he sees nothing technical in these reliefs. Krassa & Habeck write in their book that they are the first ones publishing the complete texts to the bulb images. That is not quite true, they leave some passages out – and are adding passages which have nothing to do with the bulb scenes and are therefore not visible on the pictures they published. This is an invitation for wild speculation. I already mentioned the god Ihi they left out to introduce their light bulb. In addition they muse about the technical meaning of a text where “the son of Re” gets an amulet. Well, that happens on the far right of one lamp scene, where the Pharaoh (= son of Re) is given a completely non-technical piece of jewellery. The Friese contains a repetitive phrase for the whole room. The Bandeau describes the explicit scene. The side bars contain speeches of or to the king or a god. The inscreiptions overlaying the scene itself give details about the objects and person in the relief. Here is an overview of the scenes inside crypt south 1 C, the horthern wall to the left, the southern wall to the right. On this page I will explain, supported by the photographs I made there, which elements the texts address and what they mean. Let's see what is left from the electro hypothesis then. I will start with the texts of the “working lamp” on the northern wall. I will not anticipate the next page, but Krassa & Habeck think that the whole texts are dealing with the god Thot, who was in their eyes the commander if the space ship Re, bringing civilisation to humans. So let us count how often Thot is mentioned, in comparison to other gods like Harsomtus, Ihi or Hathor. (1) Resomtus climbs out of the horizon into the sky as a disc of gold, as the master of the nhh-eternity during the day, with many forms (hprw) in the hours between morning and evening. (2) The followers praise him at the beginning of the morning and the htt-monkeys are cheering before him while his beings of power (pictures) are protected in his sanctuary, because they are protected in the shrine of his Ka, and he gives daily rays of light from the sky to his mnw-image. (3) Their hearts are jubilant seeing him (that is to say) Khepre in the blossom, who appears al Living-Ba, lord of life he gives [to] who he loves. He repeats himself in the form of the falcon on the serakh who appears with a disc and a double feather. (4) He changes in his chamber into Ihi-the-clean, the King of Upper Egypt and the King of Lower Egypt, afte he has united with his chamber in the house-of-the-Sed-Festival, to conduct millions of Sed-Festivals. (5) He steps into he house-of-the-bier in his large shrine on the morning of the new moon day of the fourth month of the prt-season. (6) He may protect his son, the King of Upper- and Lower Egypt, for eternity. This is the general description of what habbens on this wall. Resomtus, the god of the young sun, rises from the horizon into the sky. Does not sound like a lamp. The “many forms” in passage (1) are dealing with an aspect I mentioned on the last page: in these late times of the Egyptian culture every hour of the day the sun was represented by another god. Here Resomtus rises from a lotus flower, like in the “lamps”. This is the symbol wor the creation of the universe, where the sun god Re rises as a serpent from a lotus blossom, Resomtus is here in the role of Khepre, the god of the young sun. 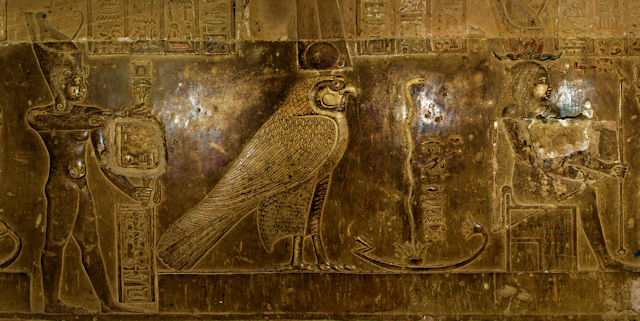 Also, he is equalised with Horus, a sun god from the earliest times of Egypt. Verse (4) deals with the lamp section. Resomtus turns into Ihi, the god of musicians, and stands on the left of the lamp scene. There a date is mentioned, when the “lamp” is switched on – or what is really to be seen here. The sunrise on the new-moon-day in the last month of the flowering season (Peret), in our calendar at the end of january. A lamp that Is used on one day of a year? Very inefficient. The main inscriptions describe the details of the relief. W.t.s.o. Ihi the great, the son of Hathor, the lordly child of the eye of Re. W.t.s.o. Hathor, the great, mistress of Dendera, the eye of Re, the mistress of heaven, the princess of all gods, the disc in the sky, which sheds light to the earth, the stars are following her will. This text is about the scene on the left of the relief. Ihi, the person with the strange sticks in his hand, leads Pharaoh Ptolemeius XII (n the far left, mostly destroyed) before goddess Hathor. This is the main theme in Egyptian temple reliefs – the King introduced to a god. Right at the beginning we find the text spoken by Ihi Krassa and Habeck connect with the “light bulb” on the right side – quite far away. The following textas are about the scene in the middle of the relief already shown above. It describes size and material of the cult object where Somtus rises from the lotus flower of the day barge. W.t.s.o. Harsomtus, the great god who is in Dendera, the living Ba in the lotus blossom of the day barge. W.t.s.o. Harsomtus, the great god who is in Dendera, the falcon with the cloaked wings. W.t.s.o. Harsomtus-the-child, the son of Hthor, the beautiful child of the Golden One, the lord of making music for his mother, the eye of Re who is loved from the big Nine, when she sees him, he who is the znn-image of Reharachte, the splendid child of whose-name-is-hidden. This is spoken by Harsomus, on the left of the bulb with the rattles in his hand. He has himself transformed into Ihi-the-clean, as was told in bandeau-text (4), so we have another Ihi who is not a light bulb. He is talking to the person behind the “light bulb”, with the snake on the forehead. This is usually worn by a Pharaoh, therefore I assume that this is Ptolemeius XII. 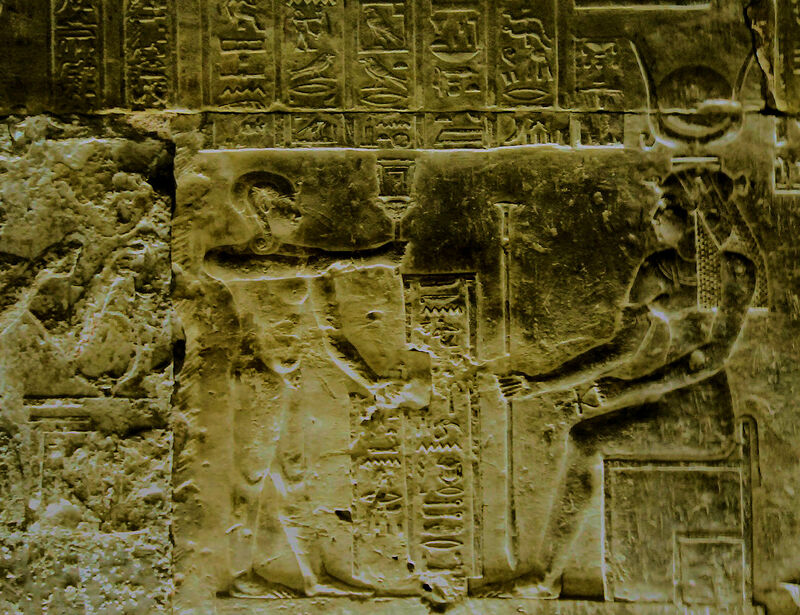 Dd and nh are, as mentioned on the page before, nehen and djed time, and w3s is the sceptre of a Pharaoh, we can see it on the right in the hands of the person in the shrine. W.t.s.o. Harsomtus, the great god who is in Dendera, who rises from the lotus flower as living.Ba, whose perfection is risen by the km3tjw-images of his Ka, whose ssmw-image is worshipped b the crew of the day barge, whose body is carried by the dd-pillar, below his ssmw-image the primeval beginner (Hathor) sits and whose majesty is carried by te companions of his Ka. This ist the description of the lamp scene. The snake is Harsomtus, his body is carried by the Djed pillar, which is carried by the day barge. Therefore the “cable” is identified as a boat, a reed float when we take the colour of it in the colour images into account. The Egyptians believed that the sun was carried on the day barge across the sky during the day. His “perfection” or “majesty” (= the bulb) is carried by the statues of his Ka (two, because Harsomtus also appears twice, as snake and as Ihi). The description of the bulb scene is not complete, the missing parts are mentioned on the other wall..
W.t.s.o. 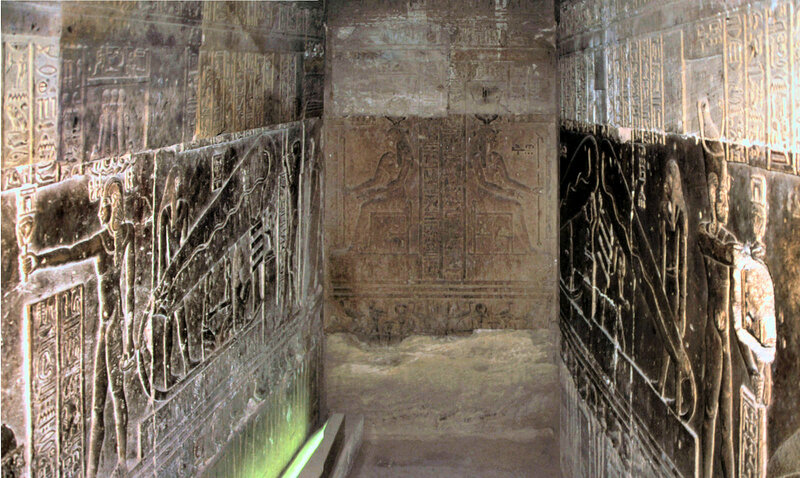 Harsomtus, the great god who is in Dendera, in a secret form, who is protected in his shrine. Upu, wrongly identified by Krassa and Habeck as Thot, is the oartner of Hathor and protector of Harsomtus, as I explained on the previous page. Unfortunately, for reasons unknown, my pictures from the rightmst part of the relief where the Pharaoh gets an amulet are out of focus and not usable. The reading direction is here from the right to the left, the bulbs are therefore mentioned also in the last portions of the texts. (1) Resomtus is alive with gloss in the sky (and) lives at the day of the New Year celebration. He lights up in its house in the night of the child in his nest, by donating the light to the country from the birth bricks. (2) The sky is jubilant, the earth is pleased and the God chapels is glad, when he appears in his chamber in his procession barge at his beautiful celebration of the New Year. (3) The God with his disk has come to see him. Nehebkau gives him reputation, and the goddess with her disk, with godly body, rejuvenates him in his sanctuary. (4) Tchnt tpjt jnr (probably the goddess Thoeeris, a birth goddess) is content because of her majesty. She praises Re because of him with praise for his Ka, with wine from schfjt (wine area) and meat bits on the altar before him. (5) The "land-of-Atum" (= Dendera) is prepared with his most distinguished plan, as Hu and Sia are subordinated to him. (6) He may protect the son of Re ( ), forever. This again is the description of the whole scene. It seems to be about he sunrise on the new years day. The main inscriptions are beginning wih the not shown part where an amulet is given to the king. Beleive me, the scene is really there, although Krassa and Habeck pretend otherwise. Bringing of the amulet (Pektoral) made of gold. W.t.s. : “This is the protection of your majesty for the celebration, in ktmt gold. W.t.s.o. Ihi, the great, the son of the Hathor, the noble child with shining plait: I please your heart with glories for your person, and I drive rage out with spells. The king of upper and lower Egypt ( A ), the son of Re ( B ). “I came to you, to your place [...]. Beautiful one, whose looks are perfect. I have the Amulet of gold [...] attached with live on the day of the celebration [...] of your body. Now I continue with the visible sections. W.t.s.o Isis, the great, the gods mother, lady of jat dj, who stays in Dendera, the beginning with whose arrival the earth began, turquoise skin and lapislazuli like head. W.t.s.o. Harsomtus, the great god who stays in Dendera. W.t.s.o. 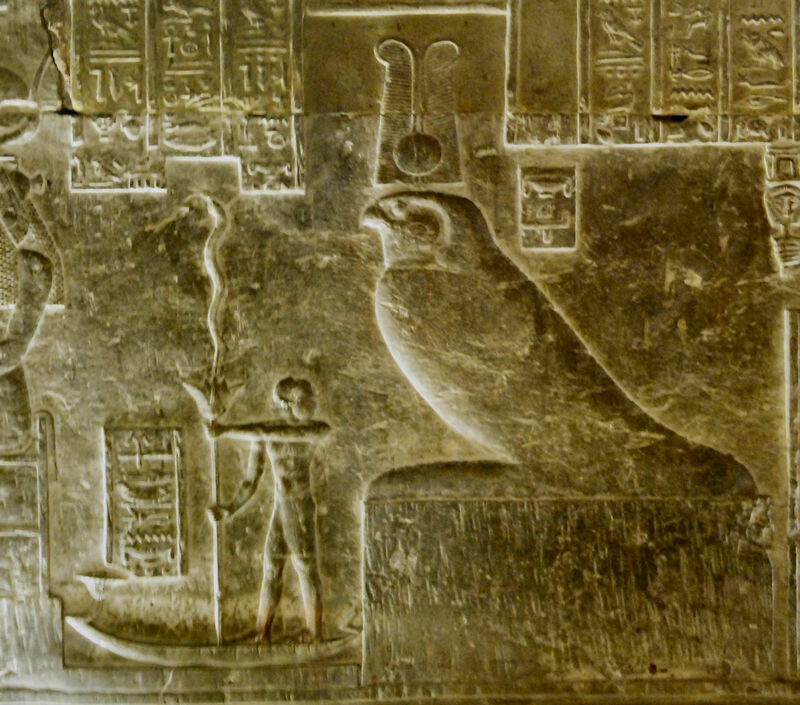 Harsomtus, the great God, who stays in Dendera, the multicolored-feathered who is on the Serech. Gold. Height: 1 cubit. W.t.s.o. Ihi, the great, the son of the Hathor, Re in its shape of the great God, who appears with the diadem as a king of jztj (Egypt)and as a master of the Sed festival. The day barge is again the strange thing right of the falcon, where again the young sun rises from a lotus flower. The sed festival is a throne jubilee, normally celebrated for the first time after a reign of thirty years, after this every two to three years. To be able to celebrate a Sed festival in the ptolemeic period was only a funny wish, because the different parts of the family tended to murder each other and so not a single king of thet time ever celebrated a regular Sed festival. Now to the texts of the bulbs. W.t.s.o. Harsomtus, the great, who stays in Dendera, the living Ba in the Lotus flower of the day barge, whose perfection the two arms of the Djed pillar carry as its seschemw picture, while the Ka's on its knees are with bent arms. Gold. All precious stones, height: 3 hands. W.t.s.o. Harsomtus, the great, who stays in Dendera, who is in the arms of the princes in the night barge, the noble snake, whose chntj statue carries Heh, whose crew carries his perfection in holyness, because of whose Ba the appearing (Hathor) in the sky appeared, whose shape is admired by admirers, who comes as unique, enveloped by his head serpents, with numerous names at the point of chw.n=sn (Gods with relationship with Hathor), the sechm-picture of Re in the "Land-Of-Atum" (= Dendera), the father of the Gods, who created everything. On the part on the right the “perfection hof Harsomtus” (the morning sky?) is carried by the Djed. The manikins beneath both lamps are again the Ka's of Harsomtus. The shrine is made of gold an precious stones. The relief on the left is the night barge. This was, in the Egyptian religion, a boat that carried the sun during the night through the underworld from its sunset-point to the sunrise point. Heh, who carries here the “perfection of Harsomtus”, guarantees thet this happens in all eternity. This shrine is made of gold and metal, probably the snake is made from metal like on the two day barges. I can not see the smallest suggestion which could justify an interpretation as light bulb in the texts. Both shrines were used only on a single day in the year – this makes no sense at all for a lamp. The last relief even shows an night barge, a sun that cannot be seen. What is that? A switched-off lamp? Oh, did you count, how often the master god of the crypt, Thot, is mentioned on this wall? Exactly, again ZERO times. Well, the hypothesis of Krassa and Habeck cannot be true.